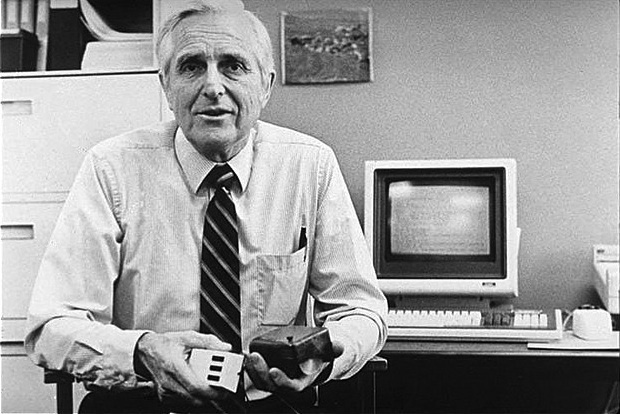 You may have read about the recent death of my friend and mentor Doug Engelbart. He was a special man, but the things for which he was best known in many ways detracted from what made him special. When your abbreviated list of accomplishments includes inventing the computer mouse and hypertext—this at a time when punch cards and cabinet-sized computers were the norm—it’s easy to toss around superficial words like “genius” and leave it at that. But Doug, while wise, was no genius. There were three things that made him special. First, he cared about people. He treated everyone with kindness, respect, and humility, regardless of job titles, age, or social status. Second, he saw the world in simple, commonsensical ways. Simple did not mean small. His vision was almost overwhelmingly big, which made it challenging for him and the people who worked with him to get anything done. Third, he was maddeningly, stubbornly consistent. He lived in the same house for six decades. He ran several miles a day until he was diagnosed with cancer in the 1990s. He used his Augment hypertext system—the same software his lab created in the 1960s running on a hardware emulator—every day. And he preached the same damn thing every day for seven decades to anyone who would listen. Not many did, and most who tried had difficulty understanding what it was he was trying to say. Even when they did understand, he couldn’t be sure. He himself had trouble understanding others, and he had been burned way too many times to trust that they understood him. For the first five decades of his professional life, Doug was something of a pariah. People in the computing field hated what he had to say. They were interested in automation—replicating things that people could do, only faster and better. Doug didn’t believe in that. He cared about augmentation—using tools to make people better. For the last two decades of Doug’s life, the world celebrated him, mostly for inventing many of the fundamental technologies that we all use today. And while he was moved by the attention, he was also depressed by it. He felt that most of the praise missed the point of what he was trying so desperately to help the world understand. The world’s problems are getting complex faster than our ability to solve them. If we don’t do something to change this, we’re in trouble. We must figure out how to get collectively smarter. That goes way beyond raising everyone’s individual intelligence, which would be nice, but would only get us so far so fast. The whole needs to be much greater than the sum of its parts. Not by inventing some magical tool. This is perhaps the biggest misconception about Doug’s work, especially in light of his many creations. Tools could help us get collectively smarter, but they would not magically do the work for us. Doug believed we needed tools that would require mastery to yield results, tools like the bicycle, which he loved. A bike is not novice-friendly. It takes time to learn, and the learning process can be frustrating. But once you learn how to ride a bike, you are capable of doing new and powerful things that weren’t possible before. There’s a reason we don’t settle for riding tricycles. Without mastery, tools themselves are pointless. We need to focus our collective energies on constantly learning and improving. Doug knew that preaching this wasn’t enough. He had to do his part. He decided to start by building tools that helped us do knowledge work—thinking, learning, communicating, collaborating—more effectively. He set out to build the equivalent of bicycles for knowledge work and, over the course of a decade, he was remarkably successful. Up until his famed Mother of All Demos in 1968, the computing world had dismissed his ideas. Then came the demo, where he unveiled videoconferencing, graphical user interfaces, outliners, hypertext, the mouse, and several other amazing technologies to an unsuspecting world. People literally gave him a standing ovation that day. Then they went back to dismissing him. Sure, the demo left an impression, and over the course of several decades, some of those tools started to see the light of day. But almost everyone missed the point of why he was creating those tools in the first place, and they missed the second half of what needed to happen when those tools existed. That continues to be true today. Maybe you can understand why Doug was depressed. Improving at improvement takes work. There are no shortcuts. We need to start now, and we need to work at it constantly, or it’s not going to happen. Tools can help us reach new heights, but we still need to do the work to get there. This is simple to understand, but not easy to do. Doug understood this, and as always, he had a story—again involving bicycles—that explained the essential challenge. As a kid, he and his brother used to challenge neighborhood kids to see who could perform the most difficult tricks. Doug had a trick that always worked. He would challenge the other kids to ride their bikes with their arms crossed. What was so hard about this? Riding straight with your arms crossed was easy. The only tough part was turning. If you wanted to turn right, you’d have to move your left arm. If you wanted to turn left, you’d have to move your right arm. In other words, you simply had to do the opposite of what you normally had to do. Two rules easily grasped, yet none of the kids could ever do it without falling off their bikes. Why? Because learning, in order to be applied, needs to be embodied. We need to build that habit and, sometimes, that means changing old habits. This is hard, but it’s not impossible. That was the other key lesson of this story. Doug could do the trick, not because he was smarter or more physically gifted than the other kids, but because he had trained his body to do it through lots and lots of practice. Doug had a way of explaining things so simply, you would either embrace them or disregard them, sometimes both at the same time. He was also incredibly kind, and in that kindness lay danger. Doug was everybody’s hero, and he treated you in ways that made you hunger for his approval. But he viewed his own body of work as a failure, so it was unlikely that he would consider anyone else’s attempt at fulfilling his enormous vision to be successful. Furthermore, as Doug himself explained, he was handicapped. There were lots of things about the world around him that he did not understand. If you looked to him for answers, you were going to be confused or disappointed. He didn’t have any answers. No individual did. That was the point. What Doug had was compassion, clarity, and commitment. He cared deeply about people, he was clear about why he was doing his work, and he was committed to pursuing his goals. These things may sound simple, even trite. But I’ve learned as I get older how rare these qualities are. Doug made it his mission to make the world a better place. His accomplishments played a role in that, but the way he treated people was even more important. I want people to embrace his cause, but more importantly, I want everyone to care for each other the way that Doug cared for every human being he ever came across. He was a wonderful person and friend, and I miss him terribly. Eugene Eric Kim, the creator of Changemaker Bootcamp, worked with Doug Engelbart from 2000-2002 and led his HyperScope project in 2006. Inspired by this work, he founded two consultancies—Blue Oxen Associates and Groupaya — devoted to helping groups collaborate more skillfully. You can reach him at eekim@eekim.com or on Twitter at @eekim. *Photo courtesy of Javier Martínez.